Upon reading Robert Campbell's critique of the Seaport/Innovation District, in which Campbell claims that "the Innovation District has all the charm of an office park in a suburb of Dallas," I sought to pinpoint the Seaport's precise shortcomings and to consider what exactly gives the Seaport such suburban, unalluring character. While I have been to the Seaport many times, I reasoned the most effective way to get a sense of the Seaport's planning and cultural shortcomings would be to embark on a lengthy, leisurely walk through the Seaport, followed by other Boston neighborhoods of comparable density and function, and see what features of each neighborhood were more or less enticing. And so, I embarked on the familiar convoluted transit journey to the Seaport. First and foremost, if the Seaport is to become a viable live, work and play neighborhood moving forward, a more direct transit link to downtown would certainly do the Seaport well. Currently, a typical Green, Orange or Blue Line rider must transfer twice to get to the Seaport! The upcoming DMU line from Back Bay Station to the Seaport will certainly make getting to the Seaport easier, but in the interim, at the very least, a direct bus from the Back Bay/Copley Square to the Seaport would certainly minimize the hassle of getting to the Seaport as well as congestion in the central subway. The officially proposed Back Bay—Seaport DMU line via Track 61. My proposal for a Back Bay—Seaport interim bus line. The bus would run via the Pike and Dartmouth Street towards the Seaport and via A Street and Berkeley Street towards Back Bay. Alternatively, the bus towards the Seaport could also run via A Street along the blue line, so as to better serve Fort Point as well as stimulate the existing development and spur further development along A Street. In the long run, the bus routing could be more practical to implement than the serpentine train route, which has been seldom used for years, is one track wide at parts and would not be able to accommodate very high speeds. Additionally, whereas train stations are costly to construct, it would be relatively simple to include bus stops in the South End and Southie, two neighborhoods for which it is currently a pain to get to and from the Seaport. In the long run, such a bus would make commuting to the Seaport from west and south of downtown much more reasonable, as well as bring energy and life to the Seaport by directly linking some of Boston's hottest spots for innovation, entertainment, dining and nightlife—Back Bay, Downtown, the South End/SoWa and Southie—to the Seaport. Once my Silver Line bus, packed with suitcase-laden people headed for Logan Airport, arrived at World Trade Center Station, I figured I would get off one stop early and "race" the bus to Silver Line Way at a regular walking pace to make the journey more interesting than past journeys spent sitting at the Silver Line's D Street Crossing. The walk took just about three minutes—I got to Silver Line Way just as the Silver Line was leaving the station following its switch from electric to diesel power and letting off passengers. The fact that I reached my destination on foot in just about as long as the bus took, as well as past trips with 1-2 minute waits at D Street, further emphasizes how necessary a faster D Street Crossing is. (Video: Ari Ofsevit (Amateur Planner) waits at D Street for roughly a minute and a half) Fortunately, an official solution is in the works to fix the D Street Crossing using transit signal priority (see South Boston Waterfront Sustainable Transportation Plan). Exiting Silver Line Way Station onto Congress Street, it immediately becomes clear that the Seaport is still very much a developing neighborhood. The area is almost desolate—there is very little foot traffic, and there are parking lots all around. The only retail in sight is a Starbucks, and subsequent travel will yield a second Starbucks just around the corner—a shockingly generic, uninspiring retail mix for a neighborhood said to breed innovation. The surrounding buildings are wide, uninspired postmodern hunks of glass and metal without much detail architecturally—very much what one might find in a suburban office park, and even with similar amounts of surrounding parking. Continuing through the Seaport, the suburban feel persists with long "super blocks" that do not feel walkable. Along the Seaport's long blocks, promise abounds. The sidewalks are wide–just waiting for more pedestrian traffic. While now many storefronts are vacant advertisements for the condos built above, in the future a diverse population of small businesses could move in and attract droves of visitors to the neighborhood. Many such businesses have already arrived, particularly along Seaport Boulevard by Liberty Wharf, where there are many enticing, unique restaurants. Walking by Liberty Wharf feels much cozier than the rest of the Seaport—the storefronts are packed closer together, and fellow pedestrian traffic was higher around Liberty Wharf than anywhere else. The restaurants along Liberty Wharf appear enticing and make one want to stop and find out more. Likewise, D Street south of Summer Street stands out as the Seaport's most pedestrian-friendly, multimodal, thoughtfully-designed district. The buildings here are more detailedly designed—ranging from the older buildings closer to Summer Street to the new, detailedly-designed, simply attractive Flats on D. Across the street from the Flats on D and their ground-floor retail is the beautifully interactive Lawn on D, a terrific use of public space. The D Street experience feels more pedestrian than anywhere else in the Seaport. In addition to narrower car travel lanes, storefronts here are closely packed, and shops and restaurants are already beginning to move in. Further down D Street towards Southie, planter medians have been installed to keep the street one lane wide in each direction, making it clear that the area is to be a low-speed, multimodal, next-generation street. Furthermore, while bike lanes are not to be found elsewhere in the Seaport other than a short stretch of Seaport Boulevard, D Street here has not only bike lanes, but a plethora of bike racks—the next generation of parking—by the existing storefronts and the Lawn on D.
The pedestrian D Street: Featuring bike lanes + racks, center planters, well-designed buildings with ground-floor retail, wide sidewalks and the Lawn on D.
D Street and Liberty Wharf set a strong example for the rest of the Seaport. In contrast to the bustling Liberty Wharf and pedestrian D Street, once west of D Street, walking along Congress Street or Summer Street feels desolate. There are fewer businesses further northwest from D Street, with the exception of along B Street and Seaport Boulevard. As one walks further south from the waterfront, the Seaport begins to feel like a lonely, undeveloped patch of land off of a highway, a feeling most prevalent when walking along long, lonely Summer Street between the Convention Center and Fort Point. The dearth of construction or retail is something that undoubtedly will not last. The Seaport is, after all, a rapidly developing neighborhood that is garnering lots of attention from real estate consumers and investors alike. However, what must be mended if the Seaport is to become a pedestrian destination is the suburban approach to planning currently being used. As mentioned earlier, the blocks on many Seaport streets are very long and straight and, minus the wide sidewalks, prioritize the flow of automobile traffic. The feeling of preference for cars is bolstered by the wide main roads that encourage high, fast automobile traffic. Even Seaport Boulevard, with its plethora of restaurants and harbor views, feels almost as speed-inducing as the 50 MPH stretch of Route 9 in Newton despite a posted 25 MPH speed limit. Following my trip to the Seaport, I paid visits to three Boston neighborhoods of comparable density and function to the Seaport: Fort Point, the Leather District and the South End. In all three neighborhoods, the architecture is much more inspired than in the Seaport—in general, the architects of years past paid much more attention to detail. Many of the old factories of Fort Point and the Leather District, as well as the row houses of the South End, are very pleasurable to look at, with intricate facades and rooflines that in many cases yield satisfying architectural surprises. There is more variation in buildings along the blocks of all three neighborhoods—the buildings remain tall and dense, yet they are thinner, allowing for more buildings to be built along a block and for more variation architecturally, resulting in a more colorful and interesting neighborhood. The street grids in these neighborhoods are more walkable and fun to explore as well. In all three, the blocks are tightly packed, with unique businesses and architecture to be found around each corner. Automobile traffic is light along the side streets, with non-resident autos largely confined to the main streets. What stands out the most, however, is the commercial mix and the ease of finding enticing commercial options. In comparison to the Seaport, where the innovative companies are hiding in tall, wide, uninviting corporate buildings, the startups of Fort Point and the Leather District are right on the streets, with large windows looking into colorful, open workspaces full of enticing displays and creations, as well as innovators at work. With such openness, Fort Point and the Leather District seem to invite collaboration more than the Seaport—the startups along Summer and Congress Streets in Fort Point give the impressions that those interested would be welcome to come take a look and possibly even collaborate. Likewise, with every corner turned in the South End, another small, unique small business jumps out at you and invites you in—galleries, independent clothes and toy stores and local restaurants and coffee shops, with very few chain stores. The Seaport is already beginning to become a chain store haven, Liberty Wharf excluded. There are already three Starbucks locations in new Seaport buildings, and even across from the Lawn on D a Dunkin Donuts recently opened up. In contrast to the older, more walkable, more diverse neighborhoods, the Seaport, with its long blocks and large, chain store-occupied storefronts, feels like a glitzy, packed shopping mall in comparison, albeit much emptier. While much of the Seaport is already developed or being developed, enough vacant land remains to develop the remainder of the Seaport in a pedestrian-friendly manner. It will be key to focus upon developing a tight, walkable street grid with thinner streets on the vacant land that remains in addition to more buildings. Like the streets and blocks, the buildings that are built should be thinner, but not shorter—in the housing-starved Boston we live in, high-density residential construction is a necessity. Like in older neighborhoods, there should be multiple, variable buildings along a block, with each building having characteristic, unique, attractive architecture. In order to attract a more diverse mix of small businesses and retail, and likewise greater pedestrian traffic, storefronts in future Seaport buildings should be made slightly smaller so as to attract more small shops and less chain stores. PEDESTRIAN MALLS--STOPPING PT. As is currently being planned, bike lanes should be constructed along the Seaport's main streets, as well as along the side streets. As it stands, D Street's infrastructure encourages biking, with both bike lanes and bike racks. However, to get to the Lawn on D area on a bike currently requires biking along busy, high-speed streets with absolutely no bike infrastructure. Even along D Street, the bike lanes are between car travel and parking lanes and not protected. If the pedestrian experience is to be prioritized in Boston, biking must be made safer in the Seaport. Additionally, the restoration of the Northern Avenue Bridge must be made a priority. The Northern Avenue Bridge, until recently a vital pedestrian and bike link between the Financial District/Downtown and the Seaport/Fort Point, was closed to all traffic due to structural concerns. Rather than cross the Seaport Boulevard Bridge, which has relatively wide sidewalks and unprotected bike lanes in addition to car traffic, pedestrians and cyclists previously had the option of using the wide, car-free Northern Avenue Bridge. As the Seaport continues to develop, particularly with the planned Seaport Square development which will include a movie theater and other entertainment options, pedestrian and bike traffic in the area will only increase as will car traffic. Accordingly, it will be crucial to ensure that a safe access point for pedestrians and cyclists remains. As proposed by Bob Beal the wide Northern Avenue Bridge could even be transformed into a pedestrian mall lined with shops and even micro apartments, akin to Florence, Italy's Ponte Vecchio Bridge. As Boston becomes more and more starved for space on which to build and more packed with development and innovators, such proposals to productively use the Northern Avenue Bridge, as well as to simply reopen the bridge for pedestrian and cyclist use, should be seriously considered. Not to mention that the Northern Avenue Bridge, a former rail bridge from the Fort Point and the Seaport's days as an industrial zone and rail yard, is a proud, architecturally significant testament to Boston's innovation heritage. It would be a shame to lose such an intricately-designed landmark that connects some of Boston's hubs of innovation and reduces automobile dependency in the area. The modified original s Line, now called s1, runs along D Street, West Broadway and East Broadway. The new s2 Line runs further south along D Street to Dot Ave, where it continues to Dorchester ultimately ending at Columbia Point. Alternatively, the s2 Line could run along Boston Street through Polish Triangle before turning onto Columbia Road, so as to better serve the development around South Bay Center. The original r Line from the Seaport to Roxbury and Longwood via Melnea Cass Boulevard, including a side route through Roxbury's Elm Hill. In addition to faster, more direct transit routing, the Summer Street i/s/r Line route through the Seaport would be a boon for the Summer Street Corridor. Currently, walking to the Boston Convention and Exhibition Center from World Trade Center Station on the Silver Line takes just under ten minutes, and walking from the Convention Center to Fort Point takes even longer. Summer Street is easily the least developed main street in the Seaport and is the furthest main street from the Silver Line. As it stands, Summer Street is effectively a highway with on-street parking—the lanes are wide, and the area is absolutely desolate. Construction of a transit right-of-way along Summer Street, which will necessitate the narrowing of automobile travel lanes, will discourage the unsafe driving behaviors that currently take place there. The construction of protected bike lanes along Summer Street, Congress Street and Seaport Boulevard will also have a similar effect on driver behavior in addition to dramatically increasing the safety of biking in the Seaport. Development is currently planned along Summer Street, as well as many of the Seaport's remaining vacant lots, by the developers of Seaport Square, among others. The developments along Summer Street will include street-level entrances and green space that is designed around Summer Street's elevated construction, paving the way for the boulevard to become a vibrant urban space. 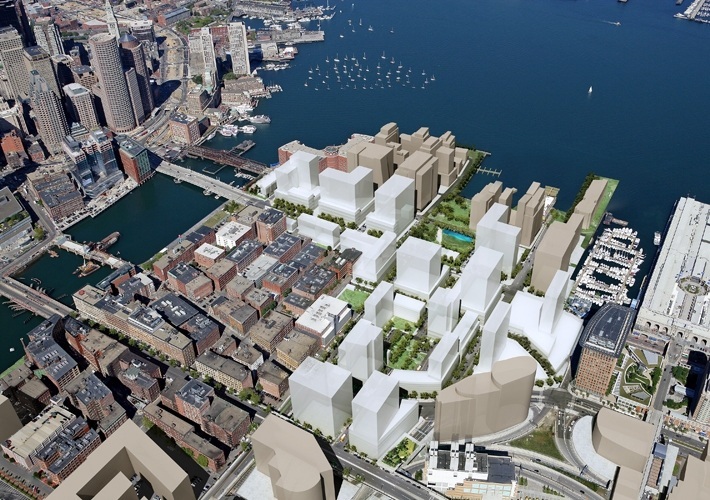 Official rendering of upcoming Seaport developments (Seaport Square white, non-Seaport Square beige). Note that a total upheaval is planned for Summer Street, taking the boulevard from a lonely elevated overpass to an urban main artery. The current Summer Street, a lonely elevated overpass. At this point, official plans have been drawn up to develop the Seaport's remaining vacant lots, and much of the neighborhood has been developed. However, he opportunity to build a vibrant, architecturally-pleasing, pedestrian-friendly neighborhood is not completely lost. Sure, ADD. However, the wide streets and the many vacant lots in the Seaport, particularly the wide undeveloped swath between B Street and Fort Point, still present an unprecedented opportunity to steer the Seaport in the right direction. If we are to build a true "Innovation District," physical development in the Seaport must encourage collaboration between innovators. Accordingly, the guiding principle for future Seaport development should be to build tighter, walkable blocks along which TIGHTER BUILDINGS CAN BE BUILT. MORE GROUND FLOOR—CAN'T EVEN SEE THE INNOVATION! FORT POINT BLEEDS IT. ADD. Future Seaport developers would do well to reconsider their plans and ADD even consider building fully pedestrianized malls SMALL STOREFRONTS ADD. Another view of future Seaport developments (Seaport Square white, non-Seaport Square beige). As it stands, the buildings are very wide, planned around existing "superblock" street design—streets are very long and very straight, without much variation. D Street and Seaport Boulevard are both great starts to the live, work and play neighborhood the Seaport is envisioned as. Additionally, there is already a plethora of green space along D Street, and as shown on the plan above the Seaport is poised to receive even more green space. All in all, the Seaport's streets are not that much wider than, say, Boylston Street in the Back Bay, which is a model pedestrian boulevard. The goal with Seaport Boulevard, Congress Street and Summer Street should be to redesign their space in a more pedestrian and bike friendly manner. For starters, as mentioned earlier, protected bike lanes should be constructed. TROLLEY + CENTER PARK. — Narrow streets give neighborly feel. PEOPLE WILL COME, BUT WE CAN STILL MAKE IT BETTER. TAKE SOUTH END'S COLLABORATIVE DENSE INTIMATE FEEL AND SHOPS, BUT TALLER. ALSO TRY TO GET RID OF/REDIRECT CARS (UTILITY FUNCTION). TALK ABOUT STREETS AND BUILDINGS HERE. NOTHING TO MAKE ONE STOP YET. WHAT WILL MAKE SUCH PLACES WANT TO COME? NOW—many vacant lots. What should be done? Too late in most cases, but still can make a difference. Put more thought into buildings. Smaller, closer-packed businesses to encourage independent shops. Tall but thin buildings along a tighter street grid--basically a taller South End.